This week is a short week for me-I am taking Friday off because friends are coming for a visit for a long weekend. This weekend is the Head of the Hootch regatta–apparently one of the biggest regattas around for rowers. I’m getting email newsletters from Outdoor Chattanooga, the Tennessee Aquarium, two farmer’s markets, and a hiking organization and all of them are hyping the Head of the Hootch as a an event to see. Given that we can practically see it from our living room, I think it will be hard for us to miss. But, back to our visitors, one is a rower and will be racing on Saturday. It’s a funny thing about taking a day off. It means that every other day suddenly becomes both compressed and extended. In preparation for taking off 1 day, I work more efficiently and with more intensity and I still end up working more than one day’s worth of extra hours in the four days that lead up to it. Is that really how vacation days are supposed to work? In any case, I’m looking forward to acting as tour guides for our friends when they come. I have a vague itinerary in my head ranging from going up to Point Park to enjoy the view of the fall leaves and downtown Chattanooga to taking them on a River Gorge tour at the Tennessee Aquarium. They have told us about two restaurants they want to go to, neither of which we’ve been to before, which is even more exciting. We actually chose to move to Chattanooga because of this couple–they had come down before for the Head of the Hootch and really enjoyed the city. When we told them we were thinking about moving to Tennessee, they were the ones who advised us to check out Chattanooga. So, we will take turns playing tour guides. I’m more or less ready for their visit, which is good. They are staying in a hotel, which is probably for the best given that our guest bed now consists of a queen sized air mattress placed on our living room floor. If I were competing in a rowing race, I would want better sleeping conditions, too. But, since I assume they will come to our apartment at some point in time, I do feel like I should clean up the place before they get here. I haven’t really thought about when I am going to do this. I’ve had a few vague thoughts that maybe it would be a good time to try a housekeeper, but upon reflection, I realized that I cannot have a housekeeper when I’m working from home. Given that there are only two distinct rooms in our place (besides the bathroom) and my office is in the largest of the two, the noise of the housekeeper cleaning would disrupt work. I miss having a housekeeper. We had a great one at our house in Columbus. Having her come every week was the perfect antidote to my natural tendency towards messiness. I don’t know why, but I would rather throw my clothes on the floor at night than to take the time to put them in the laundry. I’d rather put dirty dishes in the sink than to rinse them and put them in the dishwasher. Someone once told me that this was just a form of prioritization. Apparently, having a neat house is low on my priority list. But having a housekeeper who came once a week forced the issue. Since the housekeeper can’t clean if the floor is covered in dirty clothes, I was forced to pick up at least once a week, which is not enough time to accumulate an enormous mess. And, the house gets cleaned regularly in addition to being neater. I love having a clean house; I just don’t want to be the one who has to clean it. But now, in our apartment, it seems ridiculous that I still don’t want to spend my time cleaning it. I am happy to have a reason to have to clean it now–we still have piles of excess stuff lining the wall of the entry hallway that we haven’t figured out what to do with yet. The whole place could really use a good scrub. Unfortunately, I get an instant message from my friend telling me that she and her fiancé will not be coming after all. As it turns out, two of her team mates have health issues that preclude them participating in the race. Since the boat requires four rowers, my friend won’t be racing after all. I’m bummed–I was really looking forward to having friends come to see us. Pat and I discuss the change of events that night and decide to take advantage of my planned day off since I’ve already cleared my calendar and I need to use up my vacation days or lose them. We decide we will go hang gliding on Friday with the thought that it will be less busy on a week day and we will get more flights in that way. The next day, I call the flight park and schedule time on the training hills both Friday and Saturday. That settled, I decide I will not worry about cleaning up the apartment and will focus on keeping up with work instead. That gives me pretty much unlimited time to work, besides sleeping, eating, and working out. I’m secretly relieved that I can continue to ignore the state of the apartment for a while longer yet. I suppose if we had a place to put everything, I would be less overwhelmed by the prospect of cleaning. But having to figure out what to do with a bunch of stuff that I’ve already tried to figure out what to do with at least a half a dozen times before makes the whole notion seem like way too much effort. For a moment, I wonder if I could call that TV show that comes and puts your stuff in 3 piles: keep, donate/sell, trash. It feels like we’ve gotten rid of so much stuff in the process of downsizing that there wouldn’t be much left to deal with. What we really need is someone to organize what’s left. But, there’s no point in getting organized when we have temporary living accommodations, so I decide to look the other way instead. When I turn away from the mess and look out the windows, I see the moon rising over our apartment. 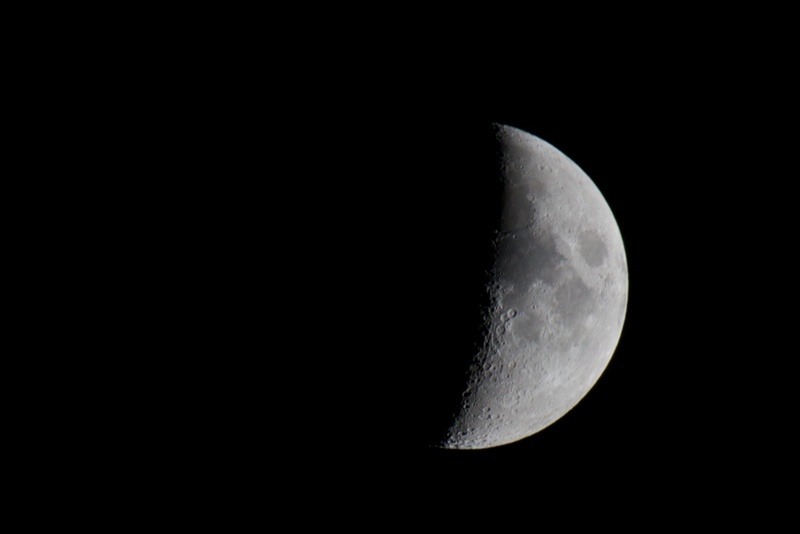 I turn my attention to capturing the moon, which seems far more interesting than cleaning the apartment. This entry was posted in Chattanooga, Home, Working from home and tagged Chattanooga, Chattanooga Tennessee, Head of the Hootch, house cleaning, housekeeping, Tennessee Aquarium. Bookmark the permalink.